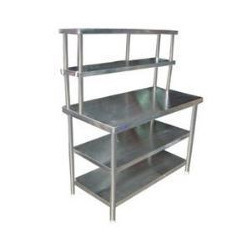 Manufacturer & Trader of Table With Over Head Shelves. Our product range also comprises of Barbeque Grill, Refrigeration Equipment and Cooking Equipment. We are an acclaimed name in the market, engaged in presenting a superior quality array of Table with Over Head Shelves. This table finds wide application use in eateries, restaurants, hotels, commercial kitchen, and food stalls. The offered table is manufactured using quality stainless steel material and latest techniques. Also, the manufacturing process adheres according to industrial norms so that quality and reliability can be made assure on the table. Further, this table is quality tested on various quality parameters. Apart from this, clients can get the table from us at industry leading prices. Looking for Table With Over Head Shelves ?